The Pakistan consulate in the eastern Afghanistan city of Jalalabad was sealed off on Wednesday after a suicide bomber detonated himself followed by gunfire. Seven people have been reported killed. Attaullah Khogyani, spokesman for the governor of Nangarhar, said the bomber had tried to join a queue of people seeking visas to Pakistan and blew himself up after being prevented from entering the building. Local Afghan officials at the scene said they were investigating the ongoing attack outside the consulate, which is also near the Indian diplomatic mission. "Two policemen were killed after the suicide attack, which was followed by gunfire," interior ministry spokesman Najib Danish told media agencies. "The incident occurred near the Pakistani consulate, but we are not sure if it was the intended target." The latest attack comes close on the heels of four-country talks in Islamabad aimed at reviving stalled peace talks with the Taliban. 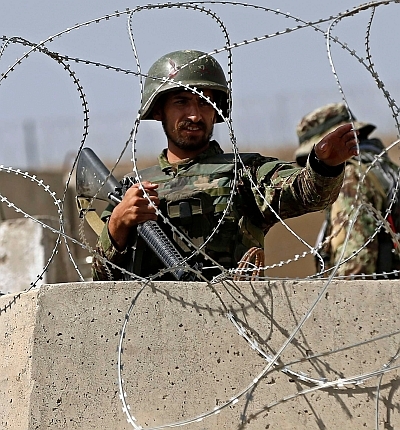 There have been several bomb blasts in Afghanistan over recent weeks at a time when efforts are underway to restart a peace process with the Taliban.